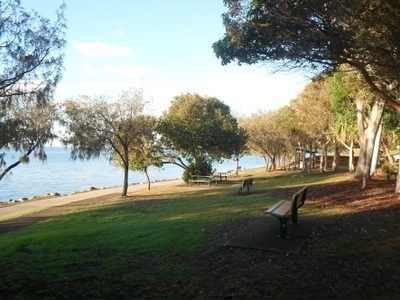 Gayundah Arboretum is a quiet space that you may want to consider for your next picnic or just for a look at the shipwreck that gives it its name. 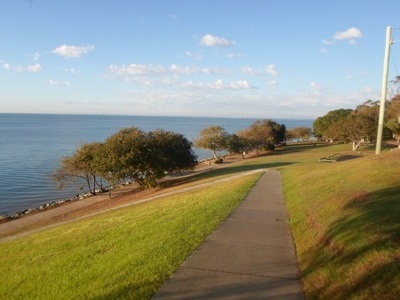 It's located on Woody Point south of Redcliffe, along the water of Moreton Bay. Facilities at the arboretum include picnic seats and tables in areas that can feel quite private with all the trees around. These trees also provide a lot of shade. There aren't too many areas to choose from though and there arboretum does not have toilets. A path runs along the bottom of the space just above the small beach that's visible in sections. If you follow it round the point instead of heading back up to the road (the whole arboretum slopes down towards the water and sits below the road) you'll discover the site's shipwreck. The ship that now resides here is the HMQS Gayundah, which had a 76 year long career covering various incarnations. It was first used as a gunboat by the Queensland Maritime Defence Force and the Royal Australian Navy, and later as a barge out in the bay. 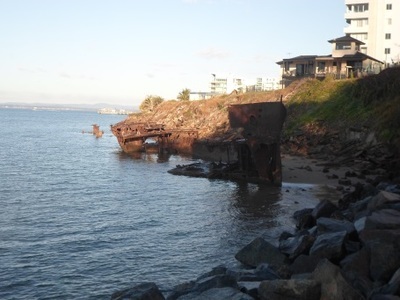 However, it has been beached at its current site and acting as a breakwater for over 50 years. There is a memorial up on the road that commemorates the Gayundah and its resting place here.